Having grown to understand the importance of archetypes – reoccurring characters, places and animals who represent elements of our subconscious; Jo has begun a playful investigation into how to embody archetypes within immersive performance. 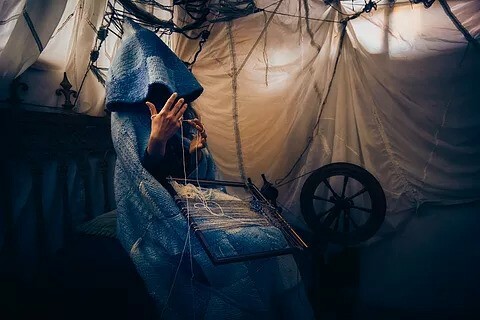 During a recent collaborative performance with Edventure Frome she combined use of personal mythology and archetypal character to embody ‘the dying spirit of industry’ interacting with a roving audience who she playfully engaged in a ritual-based performance in the boiler room of the old chapel. Jo used the archetypal character of a raven –woman (a trickster, a wanderer, one who builds up and tears down) to both disconcert those who entered the space and engage them; flipping in and out of character as they participated in the proceedings so as to make them question their own understanding of the truth. The entire cast of the performance had received training in ‘personal mythology, ritual and performance’ from John Hannigan of London-based Foolish People during the rehearsal period of the performance. The aim of the performance was to introduce to the current residents of Frome to old stories of local ‘legends’, people who had helped shaped the colourful history of the town over the centuries, in order to challenge them to become the new legends of Frome and shape the town’s future.